State legislatures are drafting laws that would mandate what doctors tell their patients about culturally controversial topics such as abortion or guns in the home, or even purely clinical issues such as breast cancer and tissue density. How involved should politicians be in the exam room?. Is depression on the rise, or just the prescriptions for it? Primary care is poised to play a bigger role in mental health care, and that puts an educational burden on internists to learn the proper role of medications. A new column debuts, outlining how physicians can properly frame risks and benefits of treatments so patients can make the best medical decisions for themselves. In this column, risk calculators are explained so the “number needed to treat” isn't so murky to a woman considering statins. Ten years later, a physician charter challenges doctors to accept commitments to professional competence, improved quality and access to care, and professionalism in conduct. What could state legislation mean to physicians as they discuss culturally controversial but clinically important issues with patients?. Readers respond: EMRs and physician incomes. Documentation of informed consent is an important deterrent to malpractice and negligence claims. 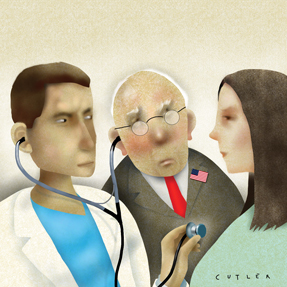 One physician describes how his informed consent process was the deciding factor in a missed case of prostate cancer, and outlines how any physician can accomplish it. Expansion of bundled payments to chronic disease treatment for internists would be complicated, but it's garnering interest. Demonstration projects show that hospitals that reduced the cost of care were able to pay physicians up to an extra 25% of what they would normally earn for their services. The Governance Committee of ACP places in nomination a list of candidates. A list of former ACP leaders who have passed.